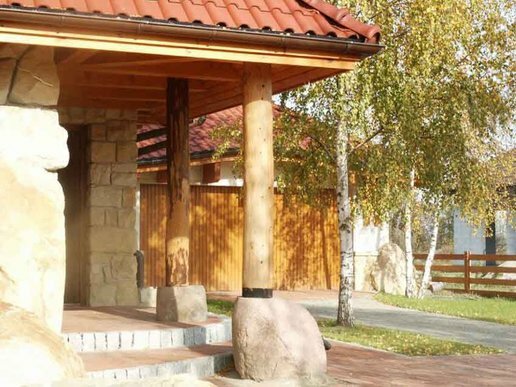 It is a house, which superbly integrates into surroundings, especially amongst young birches. Both colours and the complicated lump of the building cause that the house is harmonizing with the landscape not forcing itself in spite of its impressive sizes. Facades in the considerable part finished with stone, omnipresent wood and wavy line of the roof grant him country character but sizes make him look like nobleman's manor. This impression intensify pillars from wooden beams on stone bases supporting the roof above porches. In fact the house is very modern not only on account of applied materials but also and maybe above all for the construction.